Click Here or Call for Installation EstimateCart price includes wiring harness for experimental aircraft. Big capabilities come in a small package with the GNX 375 navigator. 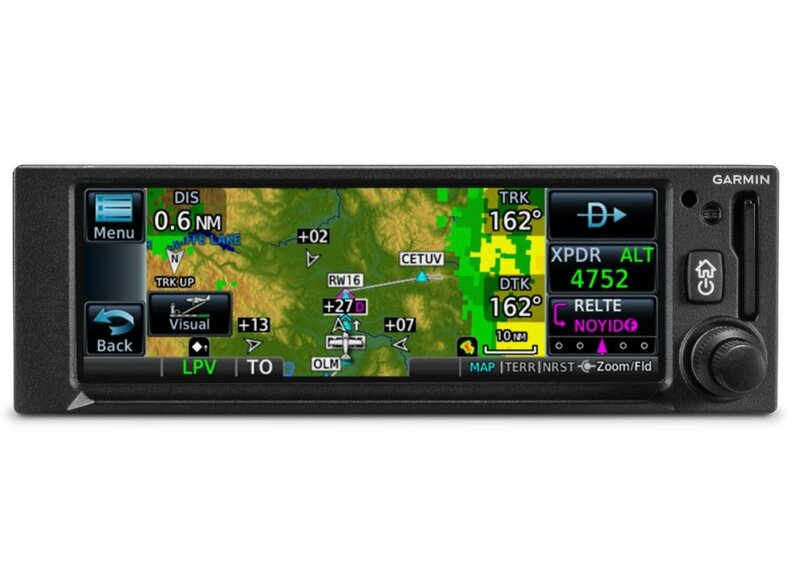 With its bright, clear high-resolution touchscreen display, you can have the advanced navigation functions you’ve always dreamed of — while meeting the requirements for ADS-B “Out” and experiencing the benefits of ADS-B “In.” Entering flight information is a cinch, and accessing every function is fast and easy. It’s equally at home in certificated aircraft or an experimental aircraft. And it’s the same 2” height as older navigation equipment and can allow you to keep the composite legacy CDIs already in your aircraft to minimize installation cost¹. That makes GNX 375 the smart, affordable way to add next-generation navigation to your favorite airplane. The moment you power up GNX 375, you’ll see a familiar Garmin homepage on the 4.8” display, which puts the most important functions within only a few touches. Navigate to dedicated pages for the moving map, traffic, terrain, weather, nearest airports, flight plan, procedures, waypoint information, utilities and more. With shortcuts available to the flight plan and Direct-to functions on almost every page, navigation features are usually just a tap away. Use your finger to pan and zoom on any map, traffic and terrain page. Enter waypoint data with the on-screen keyboard. And touch the home button to get you back to the main page at any time. For added control stability in flight, a shelf across the lower edge of the display serves to steady your hand in smooth and turbulent flight conditions. And if you prefer traditional controls, the concentric knobs provide yet another way to control many of the GNX 375 navigator’s functions. With GNX 375, building and modifying flight plans is simple. As you enter waypoints, our FastFind feature automatically begins searching for the nearest identifier as soon as you start typing, so — in most situations — a press or 2 reveals just what you were thinking. You can also create holds, insert Victor airways and corresponding exit options, and add departures, arrivals and instrument approach procedures. Additionally, you can edit your route using the map screen; a handy "rubber band" feature lets you grab any leg of your flight plan route and move it to accommodate a deviation or ATC amendment to your flight plan. A variety of dynamically drawn and displayed maps provide situational awareness and context to the flight plan by highlighting visual reporting points, navaids, SafeTaxi® diagrams and hazards such as obstacles, power lines and terrain. Plus, the Smart Airspace™ feature automatically highlights airspace close to your current altitude and de-emphasizes airspace away from the current altitude. The SBAS/WAAS-certified GPS receiver can allow you to fly GPS-guided LPV glidepath instrument approaches down to as low as 200’, greatly expanding your operational capability. You can also access newer lateral performance (LP) and all area navigation (RNAV) approaches. Precise course deviation and roll steering outputs can be coupled to our GFC™ 500 and GFC 600 autopilots as well as select third-party autopilots so that IFR flight procedures such as holds, NextGen radius-to-fix (RF) legs and missed approaches may be flown automatically. In addition, the GNX 375 navigator lets you create and execute custom holding patterns over an existing waypoint or user-defined waypoint. Plus, when operating in VFR conditions, GNX 375 can provide advisory vertical approach guidance based on a published glidepath angle or a 3-degree approach glideslope from the runway threshold, while considering terrain and obstacle clearance. With this advisory guidance, you’re able to fly more consistent, precise vertical glidepaths into a variety of airfields. With its built-in 1090 ES transponder, GNX 375 allows you to meet ADS-B “Out” requirements with a single installation, while its dual-link ADS-B “In” receiver provides a complete picture of ADS-B traffic targets as well as subscription-free weather in the U.S. For example, the ADS-B weather link allows you to access animated NEXRAD imagery, METARs, TAFs, winds and temperatures aloft, PIREPs, NOTAMs and more. Additionally, our patented TargetTrend™ relative motion technology offers a faster, more intuitive way to judge the direction and closure rate of intruding targets in relation to your aircraft’s position. For example, if traffic is ahead of you and traveling along the same track but at a slower rate, the motion vector would point opposite of its indicated direction of flight to show you are overtaking the traffic. Spoken audio alerts call out potential flight path conflicts (“Traffic, 10 o’clock, same altitude, 2 miles”) to get you looking in the right direction. And, at the start or end of each flight, TerminalTraffic™™ technology provides the most comprehensive picture of ADS-B equipped aircraft and ground vehicles in the airport environment. ADS-B equipped aircraft in-flight are easily distinguished from ground vehicles and taxiing aircraft, which are displayed using distinct colors and symbols. All information is presented on a simple, easy-to-understand SafeTaxi diagram with reference to runways, taxiways, hangar locations and more. 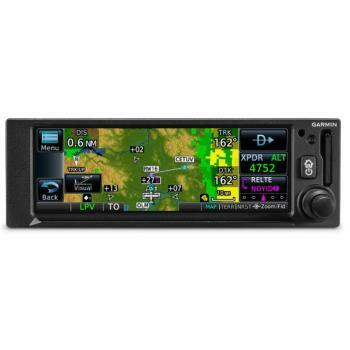 The GNX 375 navigator interfaces with Garmin flight displays, including G3X Touch (experimental and certified), G5 (experimental and certified), G500/G600, G500 TXi/G600 TXi as well as select third-party displays¹ to provide navigation outputs. It’s also compatible with many older, composite-input based CDIs — allowing you to keep your existing CDI and have an easier, more cost-effective installation¹. Better still, GNX 375 can be interfaced with a variety of compatible cockpit displays to provide ADS-B weather and traffic information. And for even more work-saving convenience, you can use the built-in Connext technology to stream information between GNX 375 and compatible Garmin portables and mobile devices running the Garmin Pilotor FltPlan Go apps. You can create flight plans at home and upload them at the airport. And you can stream GPS data, backup attitude information (from the built-in AHRS) as well as traffic and weather to your mobile device or Garmin portable, making them even more useful cockpit companions. Plus, our optional Flight Stream 510 installs in the memory card slot of GNX 375 to enable our Database Concierge database transfer and management capabilities via our Connext gateway. At home, you can download selected databases onto your mobile device by using the Garmin Pilot app. Then, once you get to the airport, Flight Stream 510 will automatically establish a wireless connection to the Garmin Pilot app and upload the databases from your device to your GNX 375 in minutes. With installation approval available for hundreds of Part 23 Class I/II aircraft models, adding a GNX 375 navigator to your cockpit is a straightforward, all-bases-covered proposition. To better familiarize yourself with the system, a free training app is available for iPad® mobile devices on the App Store®. And for worry-free flying, it comes with an industry-leading 2-year warranty, backed by our award-winning product support team. See your authorized Garmin installation center for more information on scheduling a GNX 375 upgrade for your aircraft. And experience the navigation and ADS-B capabilities your aircraft has been missing.